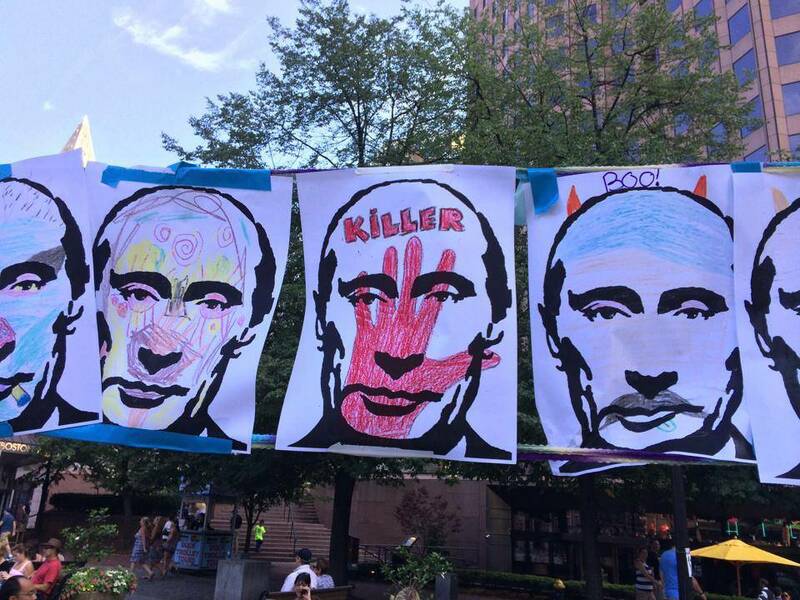 On August 23, Ukrainians in Boston creatively celebrated Ukraine’s 23d anniversary of Independence and raised funds for the Ukrainian Army fighting off Russian invaders in Eastern Ukraine. Arts Against Aggression together with Boston’s Ukrainian Community celebrated Ukrainian Independence Day near Faneuil Hall and Boston City Hall. The centerpiece of the program was Spider Putin, a repulsive arachnoid weaving webs of lies with his legs of black balloons. Spider Putin was part of the traditional Ukrainian Independence Day Flag-raising, Festival and Fundraiser. The previous day, the activists ran a Online Auction Preview for Ukrainian Independence Day Festival. As a result of all these activities, funds were raised to purchase 35 individual first aid kits ($around 3500). The reason for Ukrainian soldiers needing these kits was also made clear to visitors with an artistice Putin workstation. 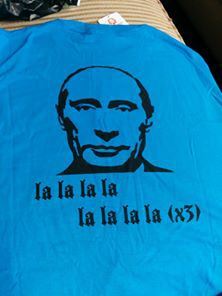 The organizers don’t plan to stop and are running a T-shirts for IFAKs Fundraiser! If you want to be the proud wearer of this lovely Tshirt and save a life, please visit the event to order.